As my mom recently pointed out, I think gaming is in my blood. As a kid I was always the one who wanted to drag out the Knight Rider board game, or The Game of Life, or Aggravation or even freaking Mouse Trap, much to the eye-rolling consternation of my parents. What I hadn’t considered until recently is the fact that my paternal grandmother was the same way, always wanting to get some games rolling but rarely finding anyone would would play along. Except for me, anyway. Once I discovered video games at an early age, it wasn’t hard to understand why many people wouldn’t care to join me for that particular variety of fun. Video gaming back then was For Nerds Only, the pasttime enjoyed by Peter Lightman-type geeks while all the real kids were out playing football or falling off the roof or punching each other for fun, or whatever physically-oriented children did. (I wasn’t one, so I literally have no idea.) Nowadays, with video games having gone so completely mainstream, it’s a bit more unusual to find someone in my age bracket who wants nothing to do with them. But tabletop games? Seriously, I don’t know how anyone who breathes oxygen could not enjoy at least a handful of these things. Having recently discovered the newly-resurgent tabletop gaming arena, I’m amazed at how much fun there is to be had with boards, cards, dice and the like. Games that challenge the mind, games that force you develop and execute strategy, games that actually encourage you to be social with real people. Everything that our elders told us video games were preventing us from doing, plus all of the fun of video games to boot! How can you go wrong? Today’s lunchtime tabletop gaming extravaganza at the office was headlined by Ingenious, a tabletop game of the more traditional variety. Reminding me of a sort of shape-based Rummikub on crack, it features a board covered with an array of hexagons and tiles sporting shapes in up to six different colors. As you lay down tiles, you score all of the contiguous similarly-colored tiles adjacent to you. Set down a blue tile at the end of a row of eight other blue tiles, and you’re gonna score a lot of blue points. These points then translate to your own scorecard. Each player’s scorecard has one row for each of the six colors, and 18 columns. The idea is to score as many of each color as you can. 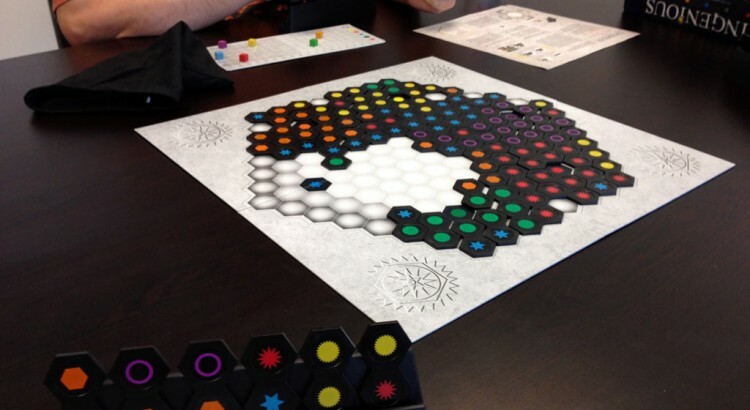 When you reach 18 of one color, you call out “Ingenious!” and immediately you get to lay down an extra tile — meaning that if you’re really, really good, you can chain together a bunch of “Ingenious” moves into a single turn. The final scoring is the real trick: the winner is the player who has the highest lowest score. Put another way, let’s say you scored 18 (the maximum) for all of your colors except yellow. For yellow, you scored only one. If all the other players in the game have scored more than one for each of their colors, you’ll come in last — even if no one else got 18 of anything. Your lowest number is your weakest link. As you can see from the picture above, as the game enters its latter stages, it’s fairly easy for certain colors to get shut out, or completely blocked off by other colors. In our game, the purple and yellow tiles were surrounded and isolated, making it impossible to score without someone laying down a whole new batch of those colors themselves and painstakingly building them up. And of course, since everyone else at the table knows what colors you need, they’ll actively try to block you by preventing exactly that. In today’s game, I had scored fairly well in most colors except for yellow, and by then, there was no way to get any more. Every time I’d lay down a new yellow tile, somebody would block it off with blue or red or some other color I didn’t need. I ended up coming in third (in a four-person game), but it was a great time anyway and I would gladly play it again. Tomorrow our office’s resident “Game Master” is away on business, so I’m converting our TiVo’s season premiere of Fringe to MP4 so I can watch it during a quiet solo lunch at my computer. I’m already looking forward to Friday, though: that’s when we’re coming in early, ordering food for delivery and taking a longer lunch to play Lords of Waterdeep, the excellent D&D strategy game that I first played with friends during our trip to Michigan last week. It takes a little longer to play, hence the voluntary schedule rearrangement. Should be a good time. Of course, I’m still enjoying my video games, too. Hardly an evening would be complete without exploring a little further into some Xbox or PC-based virtual realm or another. Last night it was more Dead or Alive 5. I’m working my way through story mode so I can earn enough titles to unlock Pai Chan, one of my game’s two remaining unlockable characters. A couple nights ago I unlocked all of Leifang’s costumes, and I just got to her chapter of the story mode. Tonight, though, was reserved for Borderlands 2 as the new Mechromancer class (a free bonus for those of us who pre-ordered, a $10 add-on for everyone else) was released this evening, more than a week ahead of schedule. I wasn’t that far into the game as the Siren, so I started a new game to see how the Mechromancer plays. I haven’t unlocked any of her class-specific skills yet, but in looking at them, I can tell that playing as this class is going to be a great time. (The “Ordered Chaos” tree is what I’ll be going for.) The stuff she blurts out as you kill things is also pretty funny, too, but that’s par for the course for Borderlands. 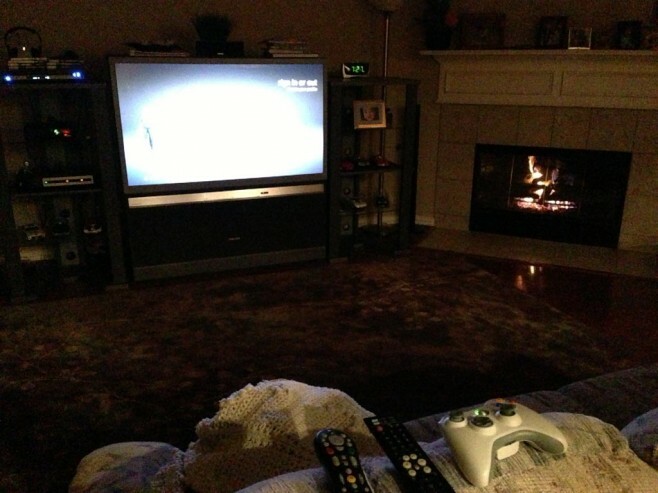 During the chilly nights we’ve had recently, I’ve enjoyed cranking up a fire in the fireplace and taking in a little end-of-the-day Xboxing while basking in its warm glow. Even though temps today were back near 80, it’s a sure sign that winter is on the way. And what’s one of the things I remember doing most fondly as a kid when it was too cold to be outside for any length of time? Why, play games, of course. Bring it on! A cozy fire and an evening of Xboxing about to begin at Oddball Headquarters.